Calfornia-born baritone Jared Bybee is currently in Salt Lake City, gearing up for Utah Opera’s production of Rachel Portman and Nicholas Wright’s The Little Prince. Bybee sings the Pilot, opposite 11-year-old Nitai Fluchel in the title role. We spoke with Bybee about working on this opera, and his unexpected path to a singing career. What was the most difficult part of your transition from medicine and economics to music? What was the easiest part? I think that when I first began to pursue music seriously, particularly opera, one of the biggest challenges was learning to come out of my shell and fully inhabit the musical or dramatic task at hand. In the medical field, things tend to be more serious and restrained, so it took a little bit of time to get comfortable engaging different sides of my personality and giving them to different characters. There’s something about singing that’s so personal… it’s like you’re sharing your soul all the time with everybody, so it just takes time to feel confident that what you’re sharing is authentic. In my case too, even though I took piano lessons as a kid and also played in the school band, I wasn’t in drama or any choruses growing up, so the world of opera was a completely new experience for me. As for the easiest part of this transition: When I first started taking voice lessons and singing in the university chorus, it felt like an escape for me from the academic grind of being an econ major and pre-med student—be that physics homework or writing a paper about demands in certain markets. When I decided to move to New York and make music my full-time pursuit, it was a relief to take what had been a source of fulfillment in my private life and to extend that to my life as a whole. Consequently, auditioning and being a musician in general has never felt like a chore. I also found that studying the sciences and a number-driven subject like economics prepared me well for studying scores and learning roles, since music is so mathematical in a sense, and you have to be able to efficiently take in a lot of information. What are some unique challenges of performing a work intended for young audiences, and with sharing the stage with a young performer? Honestly, on the occasions throughout my career that children have attended dress rehearsals as part of a school field trip, they’ve always been some of the most engaged audiences I’ve ever sung to. I feel like the innocence of young kids allows them to easily suspend reality and get into the story, so I don’t really see it as a challenge to connect with them in performance. In terms of sharing the stage with young performers, this is actually my first time singing alongside a child lead (Nitai Fluchel, who sings the role of the Prince). He’s 11 years old and was naturally a bit nervous taking on such a big role, as anyone his age would be. It can also be difficult, even for an adult, to maintain focus for an entire three-hour rehearsal like we often have. So working with him and establishing a rapport has, I think, made it feel more natural and fun for him to interact with us adults in the cast. We all share responsibility for introducing him to opera and how it works behind the scenes. I should say too that the Madeleine Choir School students who make up the chorus have been spectacular, and our director, Tara Faircloth, has made them an integral part of the production. (Nitai is among the students who auditioned, but was chosen for the lead role.) It’s been a revelation to see how intelligent, focused, and beautiful they sound. 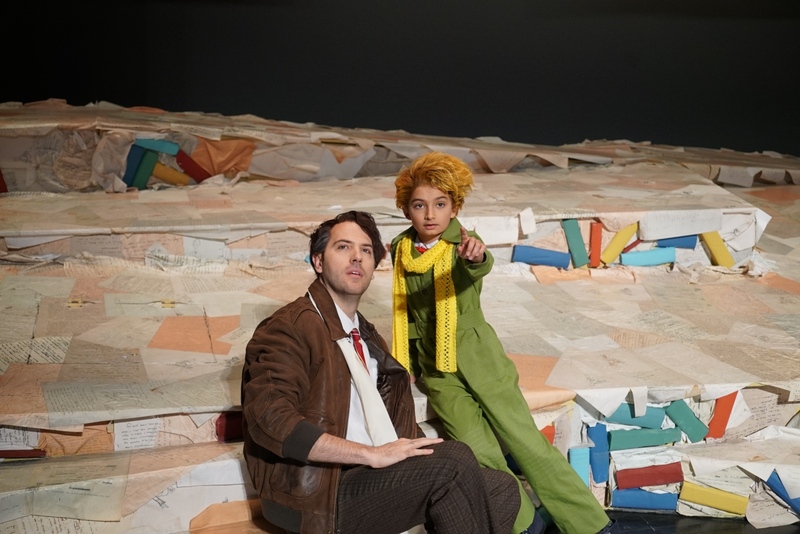 Jared Bybee and Nitai Fluchel in Utah Opera's production of The Little Prince, 2018. Photo courtesy of Utah Opera. What can you tell us about the Pilot in The Little Prince? The opera, like the book, is coming from the Pilot’s perspective. It’s his story of finding his youth and innocence again. What’s interesting about the new Utah Opera production is that the Little Prince could be someone the Pilot actually interacts with, or just a figment of his imagination that represents his own youth. It’s left up to the viewer, but in any case the opera is about the Pilot rediscovering beauty in the world, after being bored with his life and only feeling alive when he’s flying. The Prince helps him see what’s special in the things around him and in the mundane, and I think that effect from interacting with a child is something adults can relate to, while kids in the audience might be more taken with the immediate action and the staging. There’s also an autobiographical aspect to the role, since in this production the Pilot is narrating from the Long Island home of the book’s author, Antoine de Saint-Exupery, who was also a pilot. My role jumps between narrating to the children in the chorus and going back in time to relive the story of meeting the prince. It feels like music and opera chose me. As we were discussing before, I had different ideas for my life. I was set on taking a more traditional academic route and becoming a physician like my father, but I ended up turned in this other direction and when I look back, it just feels like this was the path chosen for me—the path most satisfying to my soul. Singing is one of the most intimate, personal, and relatable ways to share oneself with the world and I think it’s given me a platform to express who I’ve been all along. I wish I had recognized that hearing “no” is not necessarily a bad thing. Rejection is one of the most important things you have to embrace as a performer, and being told that you’re not ready or not right for a certain role can be a great impetus for growth. It’s a chance to go back to the drawing board and improve, as hard of a concept as that is to accept for a young singer setting out. You have this idea of how your career is going to go, you see your career blossoming in a certain way, and you’ve heard that if you have the drive, ambition, and talent then you’re going to make it. But a part of having a successful career is being able to productively face the messy reality of it, and use rejection as an opportunity to propel yourself to new heights and discover new things about yourself and your artistry. Utah Opera’s production of The Little Prince runs January 19-27. For details and ticket information, click here.